To allow user registration, You need to allow registration from Settings → General as displayed in screen shot below. Otherwise you will only have login form available for use. Since Version 1.6 Real Homes theme automatically provides modal dialog for Login and Registration. So you do not need to follow further details of this section if you are good with using modal dialog. You must restrict backend access of the user level which you have setup in the previous setup. 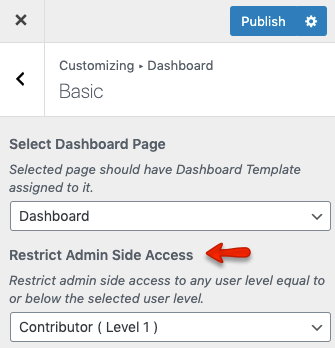 So navigate to Dashboard → Appearance → Customize → Members → Basic and select Contributor (or the user role you have selected) for the first option (shown in the following screenshot). If you have imported demo contents then Login & Register page might already be created. But you still need to configure related settings as guided near the end of this section. 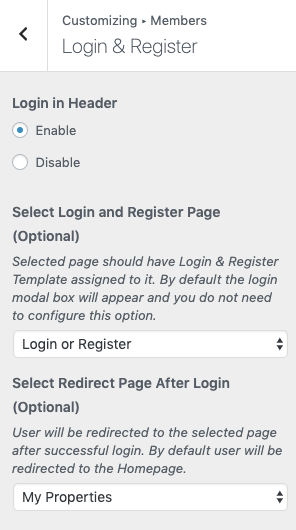 Select the Login & Register template from page attributes. Now you need to go to Dashboard → Real Homes → Customize Settings and look for Members panel. 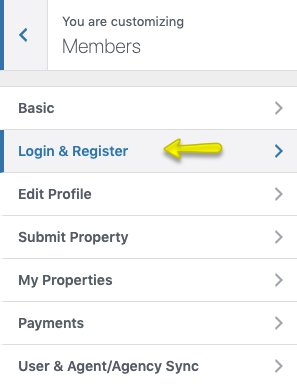 Look for Login & Register Section in that panel. Now select the Login & Register page that has been created earlier as shown in image below. Publish the settings and your Login & Register page is ready for use.